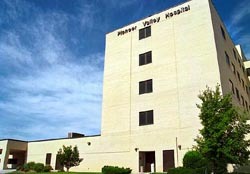 Pioneer Valley Hospital (PVH) was formed in 1983. The 146,000 square foot hospital has 139 licensed beds, 258 full-time and 74 part-time employees and a medical staff of more than 190 physicians who service the facility. The hospital also cares for 63,000 outpatient and more than 3,000 inpatient admissions annually. Most are for childbirth, digestive disorders, orthopedic, circulatory and respiratory matters. Pioneer Valley offers unique capabilities including birthing suites, a spine center, sleep disorders clinic, spiral CT scan, nuclear medicine, cardiac catheterization lab, inpatient geriatric psychiatric, telemetry beds and pool therapy. Pioneer Valley is known for having one the busiest emergency department in the state with 34,000 emergency department visits each year (an average of 98 visits per day). PVH has 17 ED beds consisting of two trauma, one cardiac, two pediatric, two casting, two gynecological, one ENT, and seven general exam. Pioneer Valley Hospital is located at 3460 South 4100 West in West Valley City. To view their website click here.